Within ten years, nine out of ten people will claim "no religious affiliation." Many of these people will live in urban areas. Church leaders must learn how to effectively engage in ministry with this urban core, a group that includes both the poor and marginalized as well as the wealthy and influential. This book will guide readers in developing a philosophy of ministry that can lead to restoration and renewal in their city. 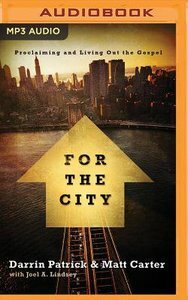 For the City relates the wisdom gleaned from years of serving their cities for the sake of God's kingdom. Carter and Patrick practically equip church leaders and Christians to look at their city as a mission field where individuals and churches can faithfully proclaim the gospel and live out the reality of a community changed and transformed by its message. About "For the City (Unabridged, MP3) (Exponential Audio Series)"
Matt Carter is the senior pastor of Austin Stone Community Church in Austin, Texas, one of the fastest growing churches in America. Matt currently lives in Austin with his wife, Jennifer, and his three children, John Daniel, Annie, and Samuel. Darrin Patrick is lead pastor of Journey Church in St. Louis, Missouri, which he planted in 2002 and currently has over three thousand people and five campuses. He is also the vice president of Acts 29, a missional church-planting network. He has been married to his wife, Amie, since 1993 and has four children, Glory, Gracie, Drew, and Delainey.